Suits are traditionally worn by men, and these clothes are structured to channel masculinity and power. We typically see these outfits in office settings, both in movies and IRL, and worn by people who exude confidence and BDE. I’m here to tell you that they’re not only for those people. When styled the right way, you can actually wear them ANYWHERE. First, let’s start off with the basics. Jane Oineza’s all-black OOTD is a classic, but she made it a bit more casual by wearing a slightly cropped top. Kathryn Bernardo also wore her suit with a cropped top—but she paired hers with a simple white midriff-baring shirt, which makes it even more casual! 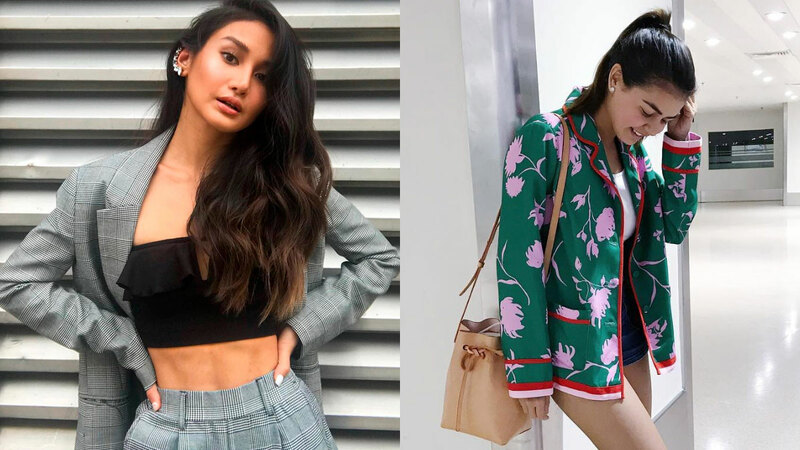 Chienna Filomeno’s traditional suit in this plaid print is now more wearable because of her ruffled tube top. Suits don’t always have to be worn with trousers. See Kate Valdez’s blazer and skirt combo with a casual pop of red! Speaking of red, Dominique Cojuangco and Mari Jasmine look red-hot in these suits! But if you’re still not ready for something as bright as red, maybe you can try Maris Racal’s orange monochrome look. Nothing screams casual more than jeans! Throw on a blazer over your denims like Heart Evangelista and Toni Gonzaga. Pair your blazer with your shirt-shorts-sneakers combo like Issa Pressman for a streetwear take on this trend. Suits can also come in dainty colors and prints like this set on Rhian Ramos. Suits don’t always have to come in structured fabrics and silhouettes. Joyce Pring’s corduroy pair is super cool and casual. Lastly, if you want to channel a tomboy look, check out Loisa Andalio’s cool girl blazer and trouser shorts combo! Straight outta your boyfriend’s closet!